Everybody can tell a story from a book read, which is why I gave my neighbours daughter this novel to read. She read it, and she reviewed it. You wouldn't believe how young she is. And one would begin to ponder, would the cause of literature in our country and indeed continent, divert any soon? Would we continue to tow the straight line of Chinua Achebe, Wole Soyinka, Ola Rotimi, very long list … Writers of thunderbolt personality that stroll the world of literature, clad in celestial garments and packaged for heaven. tales by moonlight style with which literature was served us. Even though the heavy diction and venerable show of wisdom and deep meditation, made our hairs stand on end, from both excitement and total astonishment. Our hairs are now relaxed and need the energy of youth and modern accomplishment, where literature is concerned. 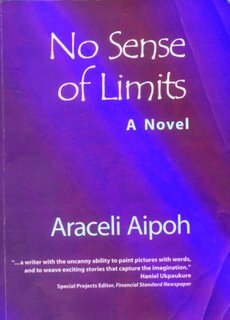 No Sense of Limits written by Araceli Aipoh, a Philippine by birth, who has lived 18 years in Nigeria is a clear confirmation, that the modern age, with all its technology can nurture literary minds whose outputs are explosive. The first starter here is the ingenuity with which the author paints a picture of the day activities of typical Lagosians. It becomes folly to thread the line of thoughts that idolizes the ancestral style of description, as the ticket to paradise. ‘Lagosians were the millions of blood cells that made the city, vibrate and be whatever it was… More than ten million people called this city home’. Pg 126. A fact presented in intelligible and simple language, but altogether mind raking, at the realization of its depth and meaning. ‘Real Lagosians always had a reason to smile. Whoever heard of a rich psychotherapist in Lagos? Lagosians never have a time or cause to think they were going crazy’. Pg 127. Once again she wittingly depicts the usual way of life of Lagosians which is void of tranquility but leaves them with no choice. While reading the preceding chapters, one would definitely be drawn to the subtle manner in which facts and events are described. Situations worthy of heavy diction are skillfully put down, sparing us the honour of euphemism, without losing it’s meaning, giving the reader no cause to accuse her of being prosaic. ‘Soon very soon, the lagoon will disappear and a mountain of garbage will rise from it. That’s what our grandchildren will inherit from us. Dirtiness. And ugliness. A mountain of garbage to flee from’. Pg 30. With droplets of humour trickling from each sloppy side, Araceli describes Lagosians, using her words as ‘having an incredible passion to assert their freedom’. No Sense of Limits is an enchanting novel, with vignettes well deserving plaudit. The book tells the story of several lives that interweave, and finally revolve around one family. It’s about the rich, their quest for insurmountable wealth, the less privileged, driven by lust for luxury, the vengeful overcome with a germless desperation for glory. The insecure obsessed with the thought of love and marriage and the cravings of all women, to love and be loved, without limits though. What makes it stunningly idyllic is the fact that all these people are Lagosians. The plot indeed reeks of the hustle and bustle of the notorious city. It is with an enviable sense of creativity that Araceli drew the picture of an extremely wealthy family, ‘The Gabriel Crokers’ and then brought the whole characters to intertwine with this one family. Gabriel Croker, an extremely wealthy banker is a widower with twin daughters. Extremely beautiful. Victoria and Elizabeth, who are two entirely different personalities, become women and fall in love. The twist begins as each find out bitter truths and blindly race on the fast wheels of vengeance. This quest later destroys the lives of others. Here we witness in soul trapping words, how humans would ignore all limits in order to create a mark like none has ever seen. We see Greg, a less privileged young boy, who rises against all odds to amass heaps of wealth beyond his dreams. Elizabeth who gets all out to get even with her twin sister. Kate who in the midst of poverty teethes her way to success. Jide. Handsome, married to a stunningly beautiful woman and privileged with a happy home, ignores all sense of limits to have an affair with his sister-in-law. Greg falls in love with Elizabeth. He is also aware of a secret that would destroy her life. Kate on the other hand becomes obsessed with the idea of marring Greg, that she would do anything to get him, and that includes killing whoever stands in her way. Victoria, would go as far as killing her twin sister, avenge her betrayal. The plot gets tense, as Laura finds out she’s the illegitimate daughter of Gabriel Croker, from his affair with her mother after he lost his wife, she’s torn between confronting her father and becoming a member of the Croker dynasty, or staying aloof and remaining the close friend of the Croker daughters. In a cool and composed mode, the writer tells of bloodshed, suffering, and pain. I agree that dynamism is an untiring traveller, it’s also welcome in the world of literature. 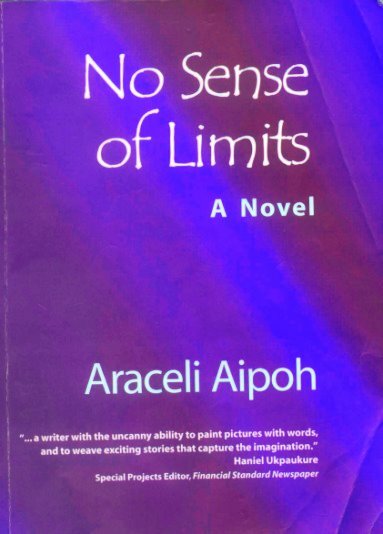 Araceli Aipoh ‘No Sense of Limits’ is a modern day thriller. I do not regard her as anything les of a Nigerian. With careful choice of words, she draws the line between modesty and taking strides away from limits. “Well behaved women rarely make history … the only time you succeed is when you have no sense of limits.’ Pg 224. It all falls in line with the storyline, showing a huge sense of direction on the part of the writer. How ever my only grouse, is that the shacks of downtown parts of Lagos weren’t quite represented, it’s up and downs are actually worth a couple of pages in a book that portrays life in a city. Araceli Aipoh, sure did a lot of homework. This piece says well for literature in Nigeria. As our mouths water for more … hope fans our embers. Gahhhhh... I shouldn't be complaining. I can't get through a single day without my R4 / R4i!